Dvar Malchus 770 – Page 2 – A taste of the Lubavitcher Rebbe's eye-opening talks from 5751-52 — The "latest word" on Geuloh! The cycle of Dvar Malchus refers to the twelve months of sichos which the Rebbe said between 5751-52 (1991-92), the latest words (“Mishna achrona”) that we have from the Rebbe. Notably, the cycle begins with the sicha of Parashas Vayikra, 5751. Although the Torah of Moshiach will only be revealed to us together with the revelations of the true and complete Geulah, these sichos are a “taste” of the “new Torah that will come forth from Me” (Yeshayahu 51:4; Vayikra Rabbah 13:3) and fittingly we start learning from parshas Vayikra. Furthermore, the sicha describes a connection to Simchas Torah, which is the day when we begin reading the Torah anew (finishing with “V’zos Habrocha” and beginning with “Bereishis”). Some background: The year 5750 (1990-91) was termed by the Rebbe “it will be a year of miracles” based on the letters that form the Hebrew year. The year 1990 saw the beginning of the disintegration of the Soviet Union and the outbreak of the first Gulf War. The year 5751 received the name “it will be year of ‘I will show wonders’”. By the time we reach Parshas Vayikra, 5751 (March 1991), the Gulf War has ended (on Purim, two weeks earlier); the events in the disintegration of the Soviet Union will lead, in June (Rosh Chodesh Tammuz), to the election of Boris Yeltsin and the end of the Communist Regime, effectively ceasing to exist upon the resignation of President Gorbachev in late August (Shabbos Ki Seitze). This new reality—the defeat of Sadaam Hussein in Iraq (and the over miracles witnessed in Israel during that war) and the collapse of the Soviet Union (bringing an end to the Cold War and the nuclear arms race)—is the background to these sichos. The day 27 Adar (כ”ז אדר ראשון) is not just a date in Lubavitch — it has become a title for the dramatic day that was the beginning of a new reality for Chassidim. This is the day that the Rebbe had what the doctors call a stroke, and since then we have not heard from the Rebbe. Gimmel Tammuz is another step, but the “silence” began on this day, Chof Zayin Adar. …scouring and clarification and purification, as is written about the time of the Geuloh “many will be clarified and whitened and purified” (Daniel 12:10). The ultimate scouring and purification is by revealing the intent in the Tzimtzum [contraction of G-dly revelation] and concealment of the Divine name Elokim itself. According to Torah, there are 7 names of Hashem that one is forbidden to erase due to their Holiness. Of them, we primarily relate to two names: YKVK and Elokim, which represent the revelation of G-dliness (the name YKVK) and the concealment of that revelation (the name Elokim). The name Elokim is the contraction and concealment of G-dly light — in other words: darkness. We find a verse in Tehillim “the sun and its shield, YKVK Elokim”, explained to mean that Elokim (concealment) is like a shield or a filter that reduces the G-dly revelation of the name YKVK so that the worlds are not nullified out of existence. According to this, the name Elokim, the contraction and concealment of G-dly light (the darkness), is for the sake of being able to reveal G-dliness within the limited ability of the worlds to receive. Like smoked glass diminishes the light of the sun but this itself allows a person to be able to gaze at the sun without being blinded. A concealment which has the intent of actually revealing that which is being concealed. …not only the nullification of the withdrawal and concealment (העלם והסתר) and of the world by revealing that the intent of the contraction and concealment is for the sake of revelation. Rather, more than this: that we reveal the intent of the withdrawal and concealment itself…not only do we nullify the inyan of golus by revealing that the concealment [of the name Elokim] is for the sake of revelation, but more than this, that the golus itself is clarified and is transformed to Geuloh, since we reveal the intent of the Tzimtzum itself, the power of concealment (which is above revelation). These are very deep concepts, we are not attempting to do them justice in this brief article. But we will try to bring them down to simpler words, which will help us relate to the event of Chof Zayin Adar over 27 years ago (and its continuation to the present time): This second aspect of the Divine name Elokim (the name of darkness and concealment) is it’s inherent value, not as it brings about or leads to something else. It is not only that the darkness as a vehicle for revealing the light, and in such a case we must nullify the darkness in order to reach a greater light. Rather, it is the lofty intent within the darkness itself — the power of Hashem’s Essence to be limited. What does that mean? That we identify and recognize Hashem in the darkness just as we do through His revelations! The darkness remains darkness, but it ceases to darken because we recognize that the darkness itself is part of Hashem no less than light and revelation. “The darkness is as light” (כחשיכה כאורה). This is even higher than crying out over the darkness (as the Rebbe explains in the maamor (בלילה ההוא, מלוקט ד) that was edited and released for publication on Purim, 5750, two weeks earlier than this sicha). Following the stroke that occurred Chof Zayin Adar, 5752, the Chassidim were worried, davening and saying Tehilim for the Rebbe’s health. There was a great and sudden darkness over Lubavitch. No farbrengens with the Rebbe, no Sunday dollars. Gimmel Tammuz was another step into darkness and concealment. Yet, in the years since then, when the concealment is seemingly greater than before, there has been revealed an even deeper connection to the Rebbe. Previously, the connection expressed itself through the way the Rebbe revealed himself. Then there was a concealment, and there was a response of crying out over the concealment. But since then, the hiskashrus has evolved and come to approach the second level the Rebbe mentions: where the concealment itself does not conceal. That the fact that we do not see or hear the Rebbe for so many years (and so we cry out to Hashem “ad mosai? !”) nonetheless does not obscure our ability to recognize the Rebbe’s presence and influence. This comes from Atzmus, meaning our hiskashrus today is coming from Etzem Hanefesh, where the concealment and the darkness themselves are converted to Geuloh — that the present situation comes to show the power of concealment, which by the Rebbe means that we come to recognize that he is just as effective in his role of Nosi Hador and Moshiach Tzidkeinu when we don’t see as when we do see, when we don’t hear as when we do hear. 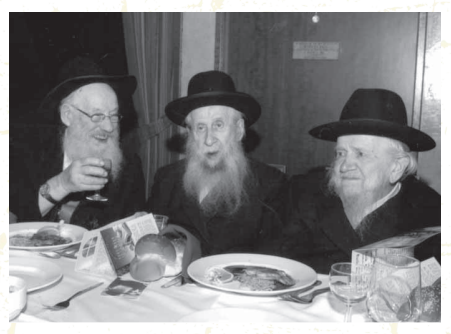 So many years have passed and yet not only is the hiskashrus of Chassidim still strong, but each year there are more and more mekushorim, many of whom were not even born before Chof-Zayin Adar! “The darkness is as light” (כחשיכה כאורה), the power of concealment which is above revelation. Nothing was lost on Chof-Zayin Adar. On the contrary: we set out on a path of establishing a greater level of connection with the Rebbe, a path which we proceed on to this very day. We do not need to cry out over the darkness, but rather to “remind” Hashem that just as the power of concealment has an intent of its own, so does the power of revelation! We can now, after Chof Zayin Adar, appreciate the power of concealment (which doesn’t actually conceal, but reveals a deeper level), and therefore we beseech Hashem that we should also have complete revelation: the true and complete Geuloh with the Rebbe Melech Hamoshiach, and we will gaze upon the beauty of our King! The Dvar Malchus begins with Vayikra 5751, but where does it end? The Parshas Vayakhel sicha is unfinished, and parshas Pekudei is missing (actually, “missing” is one of the definitions of the word*, as in יפקד מושבך). What is the message? Firstly, we could take note that the start of our Dvar Malchus cycle is parshas Vayikra. This hints at the division of the Chasidishe Parsha, Torah Ohr and Likkutei Torah — the former covering Bereishis to Vayakhel, the latter Vayikra through the end. In an odd turn of hashgacha protis, parshas Pekudei is absent from Torah Ohr (which covers all of Shemos) and appears in the other volume. What is needed now is for each one of us to reveal his spark of Moshiach through our own efforts, and not to expect someone else, not even Melech HaMoshiach, to do it for us. “Avodah b’koach atzmo“, to reveal individually what has already been accomplished collectively. To bring — each one of us — Moshiach in actuality! * Another meaning of Pekudei is connected with childbearing and the marital union, as in “Hashem remembered Sarah” (to bless her with a child) (ה’ פקד את שרה), and “a man must be intimate with his wife [before seeing out on a lengthy journey]” (יפקוד את אשתו). In fact, this second meaning is mentioned in the Alter Rebbe’s drush on this parsha in Likkutei Torah, strengthening the connection between the parsha and these words. This fits as a hint that although Parshas Pekudei is “missing”, and it might seem to some that the “husband” has gone on a journey leaving his wife alone — even so he must “be intimate with his wife” before departing (these Sichos of Dvar Malchus) and even to the point of making her “pregnant” through this intimacy: pregnant with the true an complete Geuloh.